WASHINGTON — An aide to embattled Rep. Blake Farenthold is circulating a letter to current and former female staffers for them to sign in a show of support as the fallout from a sexual harassment settlement continues to dog the Texas Republican. The letter is also critical of his accuser in the settlement. “We, collectively, are shocked and disappointed in a system that is rushing to judgment based on false statements and one disgruntled employee,” states the letter, which was emailed by Lainey Lothian, a legislative correspondent for the congressman. 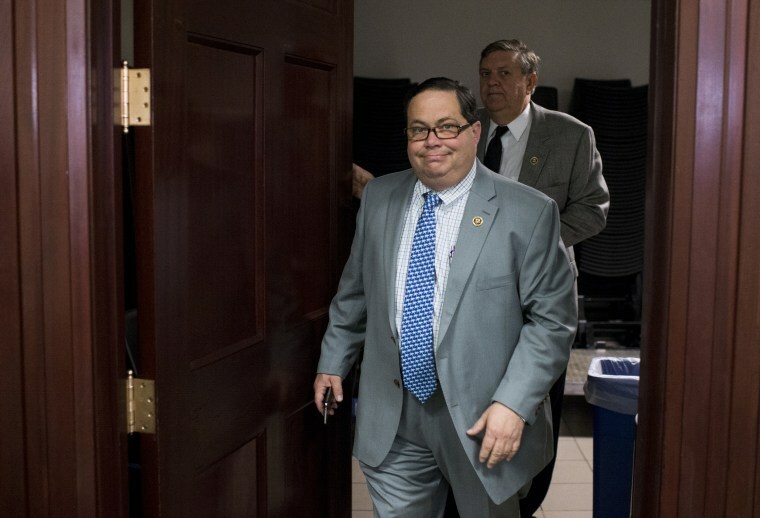 Farenthold settled the case in federal court in 2015 after Greene accused him of sexual harassment, gender discrimination and creating a hostile work place. Greene was paid $84,000 in taxpayer funds through the Office of Compliance account for workplace disputes. Farenthold's chief of staff, Bob Haueter, who was named in the suit, continues to work for him. He tells NBC News that he wasn't aware of the letter but said "there’s a great deal frustration about all that is being said by just about everyone in the office." Lothian said she did not “initiate” the letter and that no one in the congressman’s office asked her to send it but she did not respond to requests for more information on who wrote it or asked for it to be circulated. It’s unclear how many people have or will sign the letter. It has yet to be released publicly with signatories. The letter is also critical of the process. It notes that the Office of Congressional Ethics, a staff-run board, "voted 6-0 unanimously to dismiss the matter." But the Ethics Committee thought there was enough evidence to proceed. The committee continues its investigation into the accusation, an effort that intensified when the congressman's accuser agreed to be interviewed last week after Greene spoke to the press. The committee is re-upping its existing probe into misconduct allegations now that Greene has agreed to speak to the committee. Les Alderman, Greene’s attorney, declined to comment on the letter being circulated. Letters of support were also released in support of Sen. Al Franken of Minnesota and Rep. John Conyers of Michigan, two Democratic lawmakers who resigned last week amid sexual harassment allegations. Those demonstrations of support, however, were organized by former staffers, not current ones like Lothian, and did not take aim at their accusers. In Franken's case, 14 former aides signed onto the letter, which was joined by separate letters from his former colleagues at "Saturday Night Live" and more than 80 Minnesota elected officials and community leaders. Two Republican woman in the House have called on Farenthold to resign. Mia Love of Utah was the first, and Cathy McMorris Rodgers of Washington, a member of leadership, did so on Friday. Two other women, both former staffers, came forward last week detailing a difficult working environment in Farenthold's office. Elizabeth Peace, who was a communications director after Greene, described a hostile work environment in an interview with The Houston Chronicle, claiming that the congressman did little to address it. “His comments were inappropriate, and his unwillingness to immediately take action to allow us to work in a safe environment is inappropriate,” Peace said. Olivia de la Pena, a former intern, told the Chronicle that Farenthold had “anger issues” that she had to learn to navigate which, in one episode, left her in tears. Farenthold's office said that the congressman and the entire staff had undergone sensitivity and harassment training since those episodes. CORRECTION (Dec. 12, 2017, 5:42p.m. ): An earlier version of this article misidentified a former communications director for Rep. Farenthold. Her name is Elizabeth Peace, not Emily. Leigh Ann Caldwell is a political reporter for NBC News who covers Capitol Hill and elections.